Paris Police would like to remind everyone to be safe tonight while trick-or-treating. There is a chance of rain so that would diminish visibility for drivers. The Police Department is hosting “Candy-From-A-Cop” at the Police Department starting at 5:00 pm. We would love for you to bring your little ghouls and goblins by for a treat. Who knows, you may even get to meet McGruff in person. We remind parents to inspect all of your children’s candy and treats to make sure that they are safe before eating. If you are going to be out in the neighborhoods, please use some lighting or reflective material so that others see you. And as always, please be careful crossing the street. Happy Halloween! 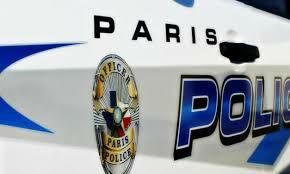 Paris Police responded to 86 calls for service and arrested three people Tuesday (Oct 30).